Gems need Certification, won’t you agree? And with an investment so big why not settle only for the best. With no universally accepted grading system for colored gemstones, there is also, in turn, no way to be able to understand how a gem should be graded or analysed. A Gemstone Report’s mission is to judge whether the stone is of synthetic or natural origin, present different kinds of data such as information about the cut of the stone, shape, transparency, measurements, color, weight and some other characteristics that are obtained using advanced gemmological equipment and skills. This information should be taken into consideration even before the purchase of the stone because it not only affects the financial value of the precious gem but can also affect the gem’s appearance and durability. Some stones, when treated to a significant degree may require special care, therefore this information is imperative and should be clearly stated in the report. Information such as the origin of the gemstone might not be determined in all cases, as only a select few laboratories specialize in this detailed information. Whether the gemstone is Natural or Synthetic (genuineness of the gemstone). Click here to read more about Natural vs Synthetic Gems. 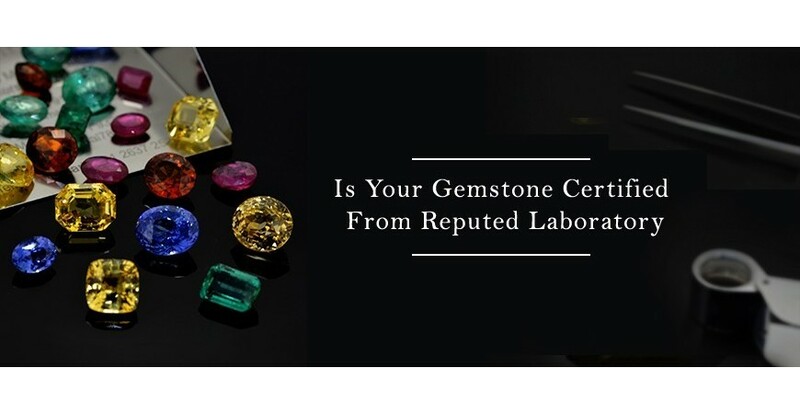 Most respected laboratories like the Gemmological Institute of America (Mumbai), Gem Testing Laboratory (India) and IGI (India) examine a stone’s characteristics, state the type of gemstone, whether it is a natural or synthetic piece and disclose information about the treatments used to enhance the appearance of the gem, all the necessary points to buying the right stone. As both nationally and internationally accepted laboratories their certificates meet all the market standards. So next time when you’re looking to buy an exceptional gemstone, don’t forget to get it CERTIFIED before you purchase it. At Nine Gems , we believe in selling gemstones with Authentic Certificate. Our Head-Office is well equipped with all gems testing equipments and experienced Gem-A / GIA qualified gemologists for efficient testing. Our gemologists are continuously involved in research & updating their knowledge regularly in order to issue 100% genuine reports of the gemstone tested. Every gemstone you buy from Nine Gems, comes with a Nine Gems Certificate. For our exclusive range of gemstones we also offer certification from GIA, GTL (Jaipur), GII (Mumbai), IGI and from various other internationally renowned laboratories.